CallingCards.com is one of the largest and best known calling card companies. We rate them a 'Best Buy'. CallingCards.com is a reseller that markets a large number of prepaid phonecards for 3rd party wholesale telecom carriers. Some of the carriers they market phonecards for include ECI, ETI, SEI, and SMARTALK. As with most resellers, these carriers are relatively unknown to consumers as compared to 1st tier consumer brands like ATT, BT, or Reliance. However, these companies offer phonecards at prices 50%-90% less than the top brands. CallingCards.com offers over 100+ individual calling cards - more than any other company we know of. The selection is almost overwhelming. Fortunately they've recently launched a new comparison tool that allows you to easily compare calling cards. The company has a 24/7 customer support operation, good support for different languages, and a very good website. The company offers a nice iPhone mobile dialing app, but is otherwise not the most innovative in terms of dialing options. As the name implies, they're about calling cards pure and simple. Bottom line: CallingCards.com gets our 'Best Buy' rating. It is one of the best known companies in the industry and carries a very large number of cards. Their cards are a bit 'dirty', but still they offer competitive rates. 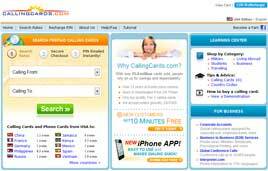 Summary CallingCards.com is a major reseller of prepaid calling cards. They sell over 100 different calling cards on behalf of several 3rd party wholesale telephone companies. CallingCards.com is one of the largest and best known online calling card companies. Parent Company CallingCards.com is one of hundreds of telephony related brands operated by Universal Calling, Inc. Other brands include CallingCard.com, MobileCaller.com ConferenceCalls.com, Interpreter.com, OneTranslator.com, and many others. Countries where cards can be bought CallingCards.com cards can be billed to addresses in most any country using major credit cards. Countries with access numbers Access numbers vary by card. Some cards have access numbers in many countries, others not. Currencies Website visitors will see prices quoted in over 50 local currencies. Please note that orders are processed in US Dollars. Competitive prices Rates are generally competitive, but usually not the absolute lowest. Rates vary by card and destination, so shop carefully. 'Clean' pricing CallingCards.com cards are generally not the cleanest cards around, so if you want simple, clean pricing you need to look elsewhere. Nevertheless, their adjusted rates are still very competitive and worth a close look. Fee disclosure Very nice rate table highlights all applicable fees for each card. A transaction fee of $0.50 on orders <$5.00 could be more prominently listed. Card selection CallingCards.com carries a very large number of cards - so many it can be confusing. Their new comparison shopping tool is a welcome addition and makes it much easier to pick the best card. Carriers CallingCards.com carriers appear to be solid companies. The wholesale carrier is disclosed for each card and a customer service number is provided to reach the carrier directly. Website The company has a very good website, but it can be painfully slow sometimes. We've upgraded them to 'green' after a major site redesign that added much nicer results pages and a very nice calling card comparison shopping tool. Well done to them for that! Privacy and security Company has appropriate privacy and security measures with credit cards and personal information. They participate in the Verified by Visa and the MasterCard SecureCard programs. Customer support We've had no problems reaching them via phone lines or live chat. Access numbers We've checked several cards and their found access lines to be in good working order. Reputation We've had no complaints about the company on this website and believe they operate a very sound business. It's been mentioned that they don't have a good rating with the Better Business Bureau, but we've completely lost confidence in BBB's scoring system - it seems completely wacky. Return policies Company has practices that are typical for the industry. CallingCards.com has consistently high ratings and is one of the strongest calling card companies we have reviewed. They carry a large selection of cards and offer competitive rates. Their new website redesign is a big improvement, although their site can still be very slow. The new calling card comparison tool is an excellent addition. We recommended you consider them for your next calling card purchase.